My wife and I purchased our Kirby G 2000 new in 2000 to keep our new home’s carpets clean. I inherited an older Kirby from my grandfather which worked fine and was 20+ years old. We used that machine as a trade-in towards our new unit and paid $1000 for it. The sales pitch was long winded but sweetly delivered, so we were sold. Nine years later, the only part to fail was the power cord. I have routinely replaced the rubber drive belt and HEPA bags as needed. They are simple to service and last a long time. I have had two brush rolls for my vacuum (the original and a replacement) in the time I have had it and it will need a new one soon. I feel the need to stress the owner servicing of the unit. I am pretty diligent about cleaning accumulated dirt and hair and string, etc. that builds up in the suction head. I feel that because of that maintenance, I have helped my Kirby G2000 vacuum last as long as it has. My gripes are few but concerning. The initial cost is brutal. Now that I know better, I think that a used Kirby is a much better deal. Secondly, the weight of the unit makes it a real “chore” to use. It is inconvenient for me to use but for my son, the electric assist function is the only way he can push it. Finally, the prices for parts are really expensive. The belts and bags are far more expensive than you would think they should be. To keep the Kirby in top shape, you have to hunt for deals on the parts it needs. All of this being said, I do enjoy the exclusivity factor of having this vacuum. It is built to last and has neat attachments that really do help around the house. Hope my experiences help! 10 years and going strong. 4800 sqft home. Raised 3 kids, 3 cats and one Black Lab. The Kirby G2000 vacuum works hard for us and is as good as it was new. Would have easily gone through 3 or 4 other mass market brands in the same time. And the attachments are awesome. It’s a little heavy, but the self propelled drive is great. Gave my wife a hard time for falling for the Kirby pitch in late 1999 while I was on a trip. But she was right. It was worth it. really this product is good!!! 1973 Kirby Classic Omega: I have a 1974 Classic Omega and have never had a problem other than routine maintanance. It has never failed to work at its best and the new belts have a crosshatching on the inside side of the belt which eliminates slippage as the older ones did though it never caused a problem once you were swinging the vacuum. I’d run the cord over a few to many times so I replaced it for $20.00. I still have a shake-out bag so that saves me money. In 2003 I went to the Kirby store and saw that all Kirbys since the Heritage model have quadrabrushes which means that there are brushes on both sides of both sides of the brush. When I’d purchased this machine June 04, 1974 it came with the type of roll brushes that were made at that time, that being a row of brushes on diametrically opposed sides of the brush roll. I said to the salesman “Why can’t I have that?” He said the parts are interchangeable and would need no modification so I bought it from him for $20.00. Between the doubling of the brush rolls bristles and the cross-hatching inside the belts to stop slippage this unit is not only in the perfect condition that it was on on June 04, 1974 but is now twice as fast at finishing a room. This unit replaced my grandmother’s 1930’s Kirby which would have still worked but needed a new switch at the time and the new model was so much larger that I had to have it. For carpet cleaning there is no better machine than this one. After changing wall to wall carpenting we discovered that there was no sand under the 15 yr old carpeting. I have all of the attachments but use a Eureka Mighty Mite canister for my floors just for convenience. When I think of the few things left on the planet that are built to last a lifetime the only things that I can think of are the Kirby vacuum and the other is an anvil. Kirby G2000 Limited Edition: Fell for the sales pitch; glad I did; however costly but realized after a couple months just how great it works, never had another that performs like my Kirby. Over the 16+ years I have owned it, no problems except replaced power cord; otherwise cleans like a charm! Bought it over 16 years ago and simply just love it! Put my Dyson to shame! : I never though in a million years I would spend so much on a vacuum cleaner, but this vacuum is awesome. If you want a clean house you’ll get one. There is a life-time guarantee and is also a shampooer, air pump, leaf blower, and paint spray gun… like I said awesome! 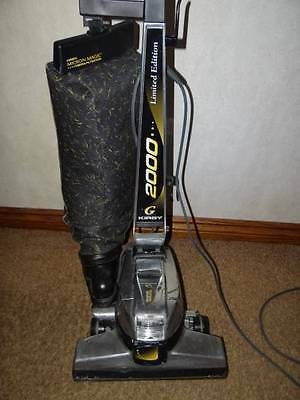 I have a Kirby G2000 with a all attachments like new plus the carpet cleaner kit’ How much is this machine worth?